Rarely do people really give the color brown a chance. It usually gets banished as a gross color, for lack of a better word, and is often overlooked because of dated style rules that simply no longer apply to today's broken fashion boundaries. Our grandmothers had no idea what they were talking about! In short, I think people just aren't sure how to wear it, therefore they've given up on it. It's seldom worn, with the exception of leather accessories, but I strongly believe that it is way underrated. Black and brown together? Super chic! It also goes a very long way with other hues too -- brown and navy, brown and white, brown and dusty pink, brown and metallic. You can't go wrong, really. The trick with brown is that you've gotta get the right shade. A deep, sensuous cocoa color is akin to navy, chic-wise, in my humble book of opinions. In my efforts to revive the color brown, I decided to don a default heritage outfit: my finest Canadian tuxedo. 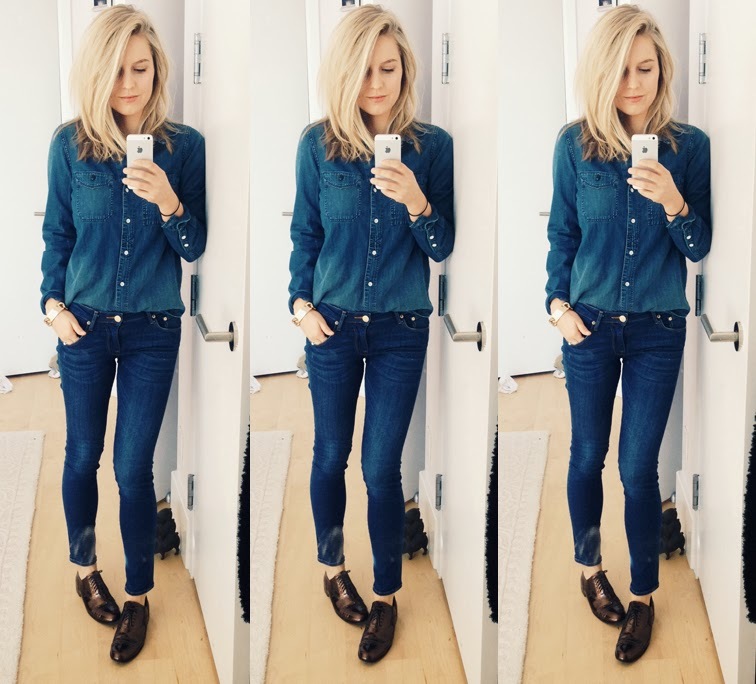 The darkish double denim provided an ideal blank canvas for my best chocolate colored pieces, and keeps it young, fun and playful without compromising on chic. Lastly, as you could probably have predicted that I was going to mention: keeping it simple is key, as per usual. Are you a brownophobe? How would you wear it? this look is maybe your best! Love it! Great style, love your jacket and your shoes! I was thinking the same! Just today I've seen two people wear a brown piece of clothing and it occurred to me that people rarely wear it, you're right.. People don't know how to wear it! You styled it perfectly though!! looove this! I love brown, I wear a lot. my office bag is brown actually. People need to incorporate it more into their lives, it solves many combination problems. the denim on denim is perfect!! and i love that vest--so chic!